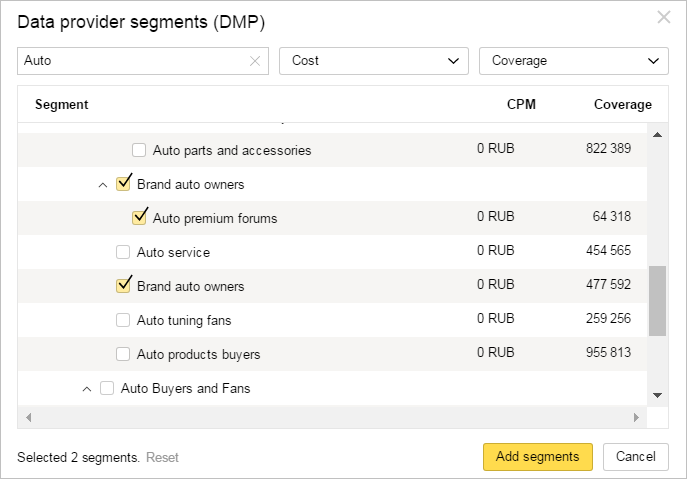 in Yandex.Audience, you can create segments based on data from providers (DMP — Data Management Platforms). They store user data and segment them by category, age, interests, services used etc. In the Segments tab, click Create segment and choose Based on external data → Data providers (DMP). In the list that appears, you will see public segments and those to which you have been granted access by data providers. The cost per thousand impressions (CPM) for public segments is set, and the segments from DMP are free. You can obtain detailed information on segments from the DMPs that provide them. To find a segment in the list, enter the segment's name in the search bar. You can also filter segments by cost (CPM) in the selected currency and coverage. Check the box next to the segment you want to add. Please note that when you select a group of segments, all segments nested within that group will be added. Segments can be used for configuring ads immediately after they are added. Note. You can't view statistics for a segment of this type, base a similar users segment on it, or grant access to it to another user. You can use segments based on DMP data when configuring ads in Yandex.Display and ADFOX. In Yandex.Display, the segment CPM will be added to the placement CPM. The segment cost is fixed at the moment when the ad placement is ordered. In Yandex.Direct, you can use only free segments that DMP have granted you access to. If a segment has been disabled or deleted by the data provider, it will receive the corresponding status and will be unavailable for use in new ad campaigns. After 30 days from the moment a segment has been disabled or removed, advertising campaigns that use this segment will be suspended. If access to a segment is revoked, it will be displayed with the “Error” status.